I remember an episode of "I Love Lucy" where Lucy desperately wanted to make everyone laugh, but sadly could not tell a joke well. 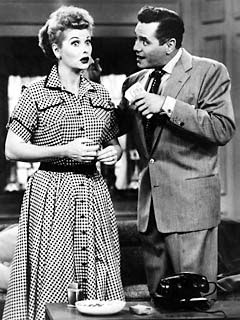 The irony of course was that Lucille Ball was one of the funniest comedians of all time, and smart enough to know how humorous it would be to actually struggle to be funny. Similarly, it takes a smart writer to think and care about whether anyone is reading them. Did you ever notice that someone can tell a story one way and get a huge reaction from the listener, while someone else can tell the same exact story, maybe only slightly differently, and bore everyone to tears? It all comes down to the delivery, and in the case of blogging, the written delivery. How do you know when someone is bored listening to you? They start looking away or checking their watch. Not very nice, but part of life. How to tell when they are bored reading you? They sign off and go to someone else's web site. Very sad. So I took a brief break from my blog last week to take some time to see what other folks out there were writing about, and how they were doing it. I looked at over 20 different blogs during the course of the week focusing on writing, communications, and marketing, and found many similarities and also many differences among them, suggesting that good, effective communication consists of several basic common denominators, as well as some surprise elements, depending on the writer's "secret sauce," so to speak. I found that the most effective blog posts for me, were short and to the point - not more then a few paragraphs. I notice also the different styles of writing that were used regardless of topic: anecdotal, with a strong emphasis on the writer's personal experience, or even someone else's experience that makes the point; technical or analytical writing, focused on metrics or quantitative results; "newsy," that is, taking an idea from an article or a tv segment and using it as a jumping off point; "questiony," ie. asking a lot from readers; "imagy," using images as a central focal point; and everyone's favorite - most of the time - the "how to," or instructional style. I think most blogs contain elements of all these approaches during their lifetime, since not all subjects are handled the same way. However, we need to realize that readers have short attention spans, and that if they are going to go so far as to subscribe to your blog, they probably will decide this based on one or two posts, and that's it. So you don't have a lot of time to get your readers' attention. Think of it like a party -- you can walk around the room a hundred times, but people will form their opinion of you from the first interaction they have with you. Hence the saying: you never get a second chance to make a first impression. Keep in mind also that a blogger does not have time to "warm up." They have to get to the point right away or they will lose their readers, and they have to make their titles and headlines interesting and provocative. If you succeed, you'll get your readers and subscribers, and your chance to perform at Ricky's club! So...how do you hold your readers' attention, and can you do it without being gimmicky?